It's almost time for it to warm up and stay warm. Mom has been working on the little garden in front of the sign. She cleaned out the weeds and grass, planted some flowers and put new edging around it. She said when it gets warm again, she'll put some mulch down and take a new photo of our sign. She planted some flowers in the garden in the back yard and I helped! She put the flowers in the ground and I took them back out for her. For some reason, she wasn't very appreciative of all my hard work. Mom & got out some Ombre fabric from the store room and put them out on the floor. We picked out some nice patterns that would look good using the Ombre fabrics. 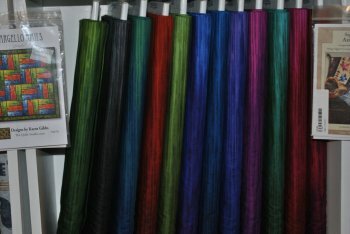 If your not familiar with Ombre, it's fabric that has the same or similar fabrics that go from dark to light across the width of the fabric. Here's some photos of our display. The fabrics on the top are a random stripe pattern and the bottom fabrics are a random scatter pattern. See how the color goes from dark to light? 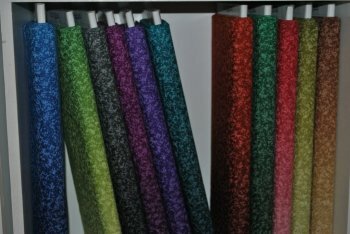 Stop in and see our new Ombre fabrics and the patterns that would look really great using them. Mom and Grandma will be happy to show you the patterns we picked out and how you can use the Ombre fabrics with them. We saw some you at the Soaring Museum quilt show on Sunday. We really enjoyed the cool gliders and beautiful quilts on display. We have some dates we need you to put on your calendars. We will be closed Wednesday, May 13 - Thursday, May 21. We are off to Quilt Market to see what need and exciting fabrics and gadgets coming this Fall. 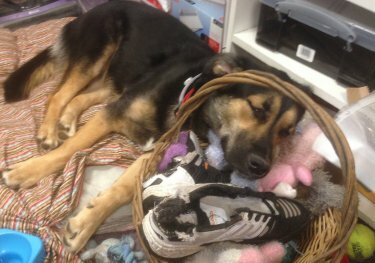 If you stop in the shop on Tuesday, April 28th and see this lazy dog, be sure to give him some extra ear scratches and belly rubs. Tuesday is Obi Wan's 1st birthday. I haven't decided what we're going to do for his birthday, yet. He will be getting an extra special treat to celebrate. We have lots of beautiful florals in stock to help you make a beautiful Spring wall hanging, runner or bag. We have Lilacs, Tulips, Violets, Poppies, Roses and much more! Soon, we'll be asking you to please excuse our dust as we get ready to enter Phase 2 of our remodeling of the Shop. There is still some decisions to be made how much we will actually be doing but with warm weather approaching, there will be some work being done. 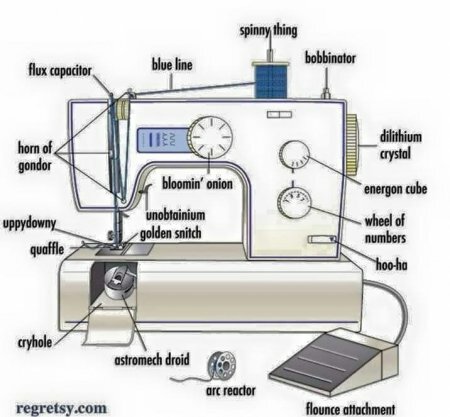 We are going to leave you with a little diagram to help you identify the parts on your sewing machine.